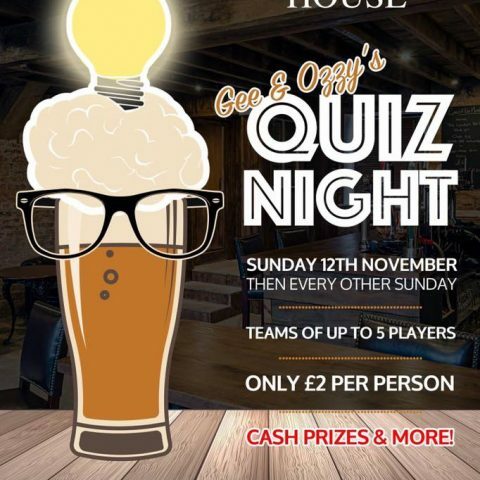 Gee & Ozzys Quiz Nights at The Coach House start on the 12th November & then every other Thursday! It’s really simple: Teams of up to 5 players Only £2 per person CASH PRIZES & MORE TO BE WON!! If you’re interested & have a team, please call in at The Coach House or contact Georgia May Bulmer via Facebook for more details. 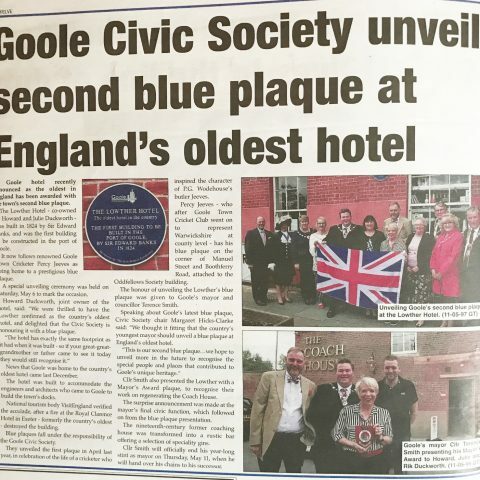 Goole Towns Mayor – Cllr Terrance Smith presented the Coach House with a Mayor’s Award Plaque, to recognise their work on regenerating the Coach House. The surprise announcement was made at the mayor’s final function, which followed on from the blue plaque presentation. The nineteenth-century former coaching house was transformed into a rustic bar offering a selection of speciality gins. Cllr Smith will officially end his year-long stint as mayor on Thursday, May 11, when he will hand over the chains to his successor. 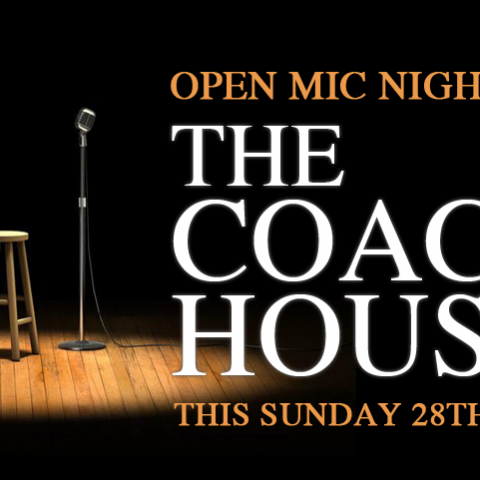 A fantastic Open Mic Night at The Coach House – Thank you to everyone involved and all who came and showed their support. Looking forward to the next one! A Huge thank you to our photographer Anne Webb too, everything captured perfectly! 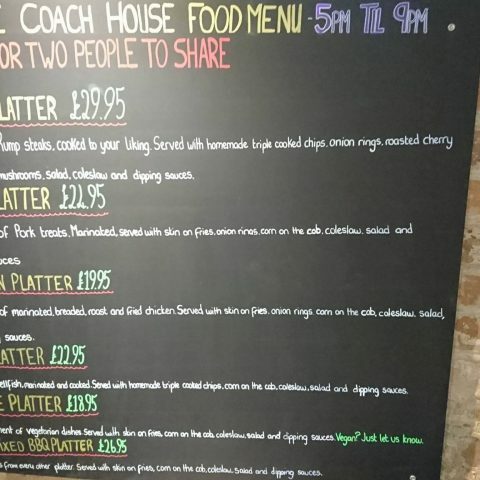 IT’S FINALLY HERE – THE COACH HOUSE FOOD MENU We will be serving our Brand New Food Menu at The Coach House from Wednesday to Saturday – 5pm – 9pm!! Ideal for two people to share we have Steak, Pork, Chicken, Fish, Veggie and Mixed BBQ Platters. Come in and enjoy a drink in a laid back atmosphere and share one of our new locally sourced and home-made platters! Our amazing chefs at The Lowther Hotel have gone over expectations on the new Coach House Menu! We asked them for fresh, locally sourced, home-made, themed platters, finger food, perfect with drinks of all kinds and they came up with so much more! 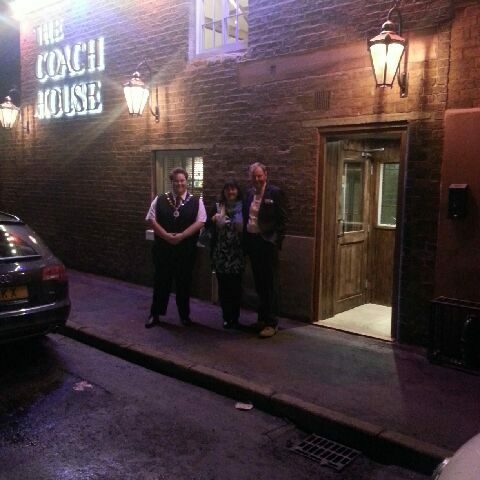 They Came, They Cooked, They Conquered… Welcome to the first sights of a New food Concept at The Coach House! The Menu will hopefully be launched soon with many more photos to share… just like the food! 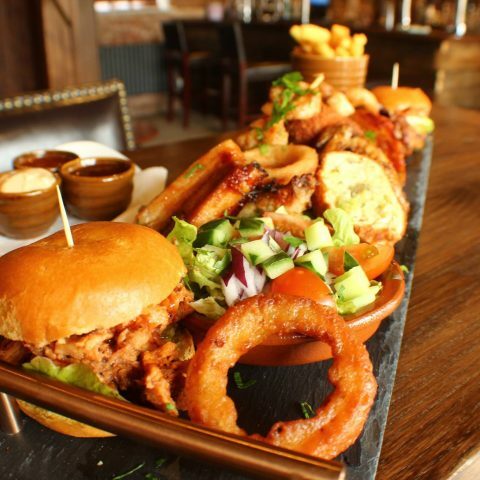 On this plater is: Marinated Pork Ribs, Pulled Pork Sliders, Marinated Chicken Wings, Herb & Spice Chicken Supreme, Haddock & Mushy Pea Fish Cake Balls, Garlic Butter, King Prawns, Onion Rings, Chips, Side Salad, Ruby Coleslaw and Mixed Fresh Dips.